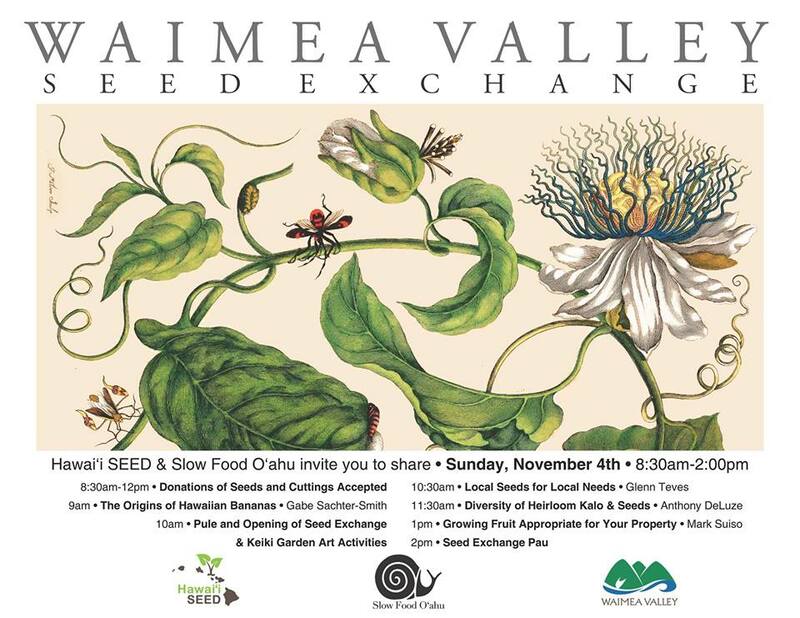 Join Hawai’i SEED and Slow Food O’ahu for our 3rd annual “Seed Exchange & Gardening Fair” in Waimea Valley on Sunday, November 4, 2018 from 8:30am until 2:00pm. Please bring your seeds and plant cuttings to share. We will be accepting plant materials starting at 8:30am. (Note the Seed Sharing Protocol below). Gabe Sachter-Smith has studied bananas since he was 14 years old in Colorado where he grew them as houseplants. Gabe moved to Hawai’i to study bananas at UH Manoa where he earned his Bachelor’s Degree in Tropical Plant and Soil Sciences in 2011, and his Master’s Degree in 2015 studying new banana varieties for Hawai’i growers. During his time at the university, he helped to start and eventually run the Student Organic Farm Training program for 5 years where he gained hands on experience in growing and marketing a wide variety of crops. He has traveled to China, Indonesia, Uganda, Rwanda, Fiji, Solomon Islands, Papua New Guinea and even Belgium and Finland to study bananas. Gabe lives on the North Shore and is starting a banana nursery and is beginning to grow fruit commercially. Glenn Teves is a County Extension Agent with the UH College of Tropical Agriculture and Human Resources on the island of Molokai and also a member of Hawaii Seed Growers Network. After attending the first Hawaii Public Seed Initiative conference in Kona, Glenn has planted seed crops in each season to create resilient seed varieties for Hawai’i’s tough, windy environment and changing weather; particularly lettuce, Ethiopian kale, mountain spinach, tomatoes, squash, and others. Through partnerships with committed farmers on other Hawaiian islands and on the mainland, he has develop tropically-stressed, heat-tolerant, and disease-resistant selections with broad adaptation. His presentation, “Local Seeds for Local Needs,” will be a power point presentation on seeds and how to process them, challenges and opportunities. Anthony Kawika Deluze is a mahi’ai and cultural practitioner. Originating from Ko’olaupoko, he now resides at the Ahupua’a o Halawa in Ka Moku o Ewa. Anthony is a father of 3 boys and has been growing kalo, both mala and lo’i since he was 8 yrs old. He now farms 2 1/2 acres of spring fed lo’I in Ka’onohi, Kalauao, Ewa. Besides kalo, other (mostly heirloom) crops such as Hawaiian varieties of mai’a, uala, ko, as well as contemporary heirloom crops like tomato, pumpkin, watermelon, native American corns, to mention a few, are grown and sold through his business Ho’aipono. Anthony is also the founder of the non-profit organization Ho’ola Hou ia Kalauao which serves to create awareness of the restoration taking place in the Ahupua’a of Kalauao, empower kanaka maoli and kanaka Hawaii through traditional cultural practice and agriculture. Anthony will be back in his element, Waimea Valley, where he spent many hours identifying kalo varieties with his mentor, the late Anakala Jerry Konanui. He wants people to plant fruit trees in their backyards again. Mark provides guidance and help for people who don’t know how to care for fruit trees and sells starter trees to homeowners. Currently, Suiso is experimenting with different varieties of mangoes to extend the season, which typically starts in early summer, and to give people a broader perspective of this beloved fruit, more than 50 varieties of which are grown here. We will also be sharing information about our Hawai’i SEED/Slow Food Hawai’i, Hawaiian Banana Propagation Project to preserve heirloom varieties of endangered bananas by expanding the cultivation and distribution of these crops. Our farming friends Tara and Dave Burlew from Malama ‘Āina Organic Farm will be engaging with our future farmers at a seed planting and recycled material Keiki Art Activity tent on the lawn-so bring the entire family! We hope to see you there, and mahalo for sharing this community event with your O’ahu family and friends. 1. Do not share seeds of invasive species! 2. Do not share brassica seeds as spread of blackrot can happen, it is a seed-borne disease and many of the seed companies are having a problem with this. 4. Label or bring a description of each of the seeds you share including date of harvest. 6. Do not take more than 25% of any seed or cutting; leave some for others.